Seven Places A Fire Is Likely To Start | MA Restoration Inc. Anywhere in your home has the potential to be a place where a devastating house fire begins. However, some parts of your home are far more conducive to fires than are others. As a homeowner, it is important for you to understand which parts of your home these are and what you can do to protect your home against fires. Our team of professional restoration contractors at MA Restoration in Worcester deal with the aftermath of fire damage and repair the damage it can cause every day. Below are the rooms in your home, in order, that are most likely to be the place where a fire starts. Far and away, the kitchen is the most likely place where a fire will start. In fact, half of all house fires start in the kitchen. No other parts of the home even compare. This shouldn’t come as a surprise, however, since your kitchen is full of potential fire-starters. There are your appliances and several different heat sources that can all contribute. 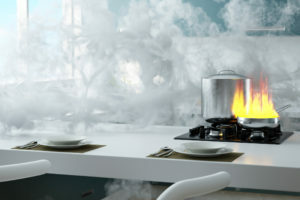 Fortunately, most kitchen fires can be put out before they become too serious since they are normally a result of an error when someone is cooking and someone is there to put the fire out. The bedroom is the next most common starting place for a fire in the home. This is typically due to the fact that there are a large number of flammable items in the bedroom while there aren’t as many in other parts of the home. For instance, a spark or small flame in your living room is far less likely to catch and start a fire as opposed to your bedroom where it could easily catch on blankets, clothes, or tools. Like everything else, chimneys need to be cleaned. Every time you have a fire, sap, and ash from whatever you’re burning coats the inside of your chimney. Determine if your chimney needs to be cleaned by doing a scape test. Open the flue, put on protective glasses, and get a flashlight. Then, shine a light up the chimney and scrape the inside with something sharp. If the residue is 1/8 inches thick, schedule a cleaning. If the residue is closer to 1/4 inch, don’t have another fire until your chimney is professionally cleaned. Living rooms usually have candles, plug-ins, heaters, and other potential fire sources. Only about four percent of fires start in the living room, but it is still important to look out for those factors. Almost all laundry rooms fires start as a result of dryer lint catching fire. You can prevent this by cleaning the dryer lint from your dryer after each use. House fires start outside 3% of the time. This is where people keep grills, smoke, have bonfires, and light off fireworks. Just know that if you have a fire outside, it could catch onto your home if you’re not careful. Since attics aren’t always accessible or rarely accessed it’s hard to recognize any potential fire-starters. Not everything is always done to code so you may have exposed wires or other safety hazards you are unaware of. As far as house fires go, make sure to stay on top of risks of fire in your kitchen and you will be half of the way there. Staying vigilant and cautious beyond should keep your home safe in most instances. For any questions about fire damage or help restoring your home after a fire, don’t hesitate to contact us at MA Restoration in Worcester.